There is no denying, protein immediately after training is crucial in supporting muscle growth and recovery – and popping a chicken breast in your gym bag might not be ideal. 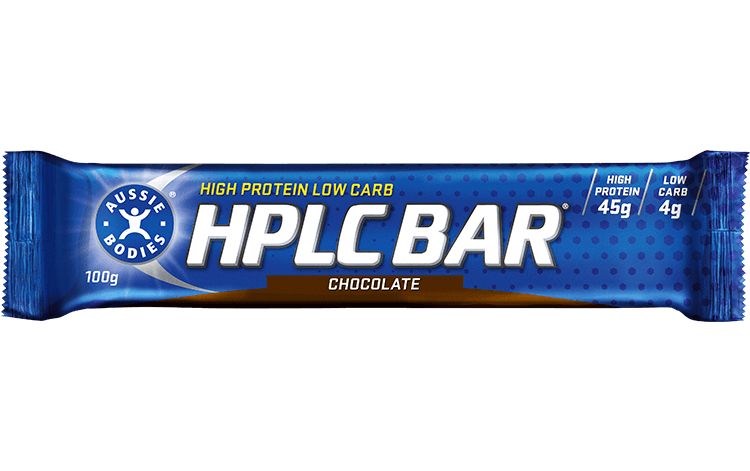 That’s why our HPLC Bar provides protein the convenient way. With 45g or 42g protein per bar it’s the perfect post-workout pick up. Because we know you put everything into your workout. Get everything out of it. Ingredients: Aussie Bodies®protein blend (42%) [whey protein isolate, calcium caseinate, whey protein concentrate, milk protein concentrate, creatine monohydrate, L-glutamine, glycine, emulsifiers (soy lecithin, 471)], protein milk chocolate (23%) [maltitol, cocoa butter, milk solids, soy protein isolate, cocoa liquor, emulsifier (soy lecithin), flavour], water, glycerol, emulsifier (soy lecithin), flavours, sorbitol, cocoa powder, preservative (202), sweetener (955). May contain: sesame, peanuts and tree nuts. Please note that the availability of flavours and sizes may vary per stockist.